My family has just arrived from California for a pre-holiday visit! On top of all of our plans to visit the German Christmas Market, watch the Santa Parade, and attend the holiday party at the Vancouver Aquarium, Christmas + Family usually equates to feasting and filling our bellies until we are bursting at the seams! We have our family traditions with our go-to holiday desserts, but I enjoy adding in a new one each year to spice things up. 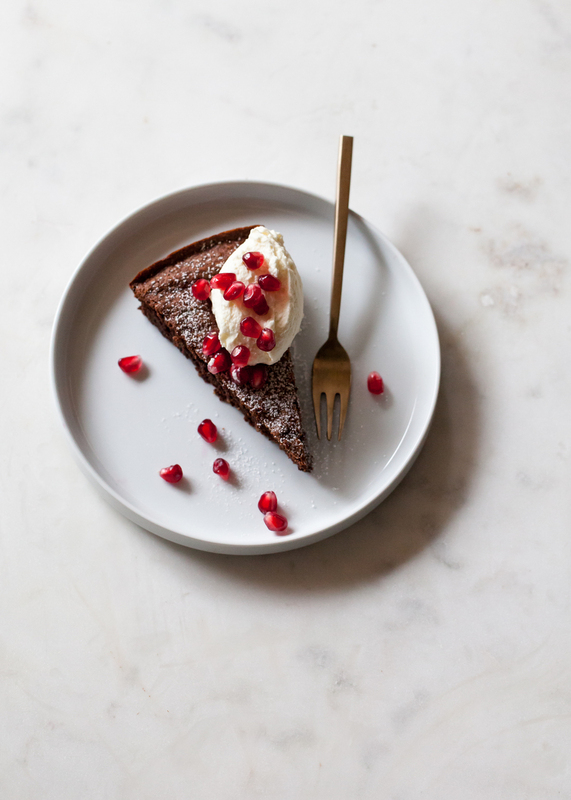 This year we are celebrating with this Chocolate Hazelnut Torte with hazelnut cream and festive pomegranate. Don't they look like little jewels piled up on a pillow of cream? So pretty! You all know how much I love anything-almond (see the last post for an awesome almond cake), but swapping in ground hazelnut meal in this torte tastes amazing! Hazelnut and chocolate are the perfect pair (think Nutella - so good! ), and the texture and flavor they create together in this torte is like symphony of decadence! Crackley on top and fudgey on the inside, a dash of hazelnut liqueur in both the tart and the cream really brings it home. Dress it up with a sprinkle on a handful of pomegranate seeds and they will burst with delight in every bite! Between cooking our (new) regular child-friendly meals to catering to those with specialty diets, I've tried to be more accommodating with the dishes I create. For desserts and baked goods, I love to experiment with different grains and nut-flours. Adding in a tad bit more nutrients and texture, using white-flour alternatives is the perfect way to justify eating a decadent dessert (especially after downing a half-dozen sugar cookies). 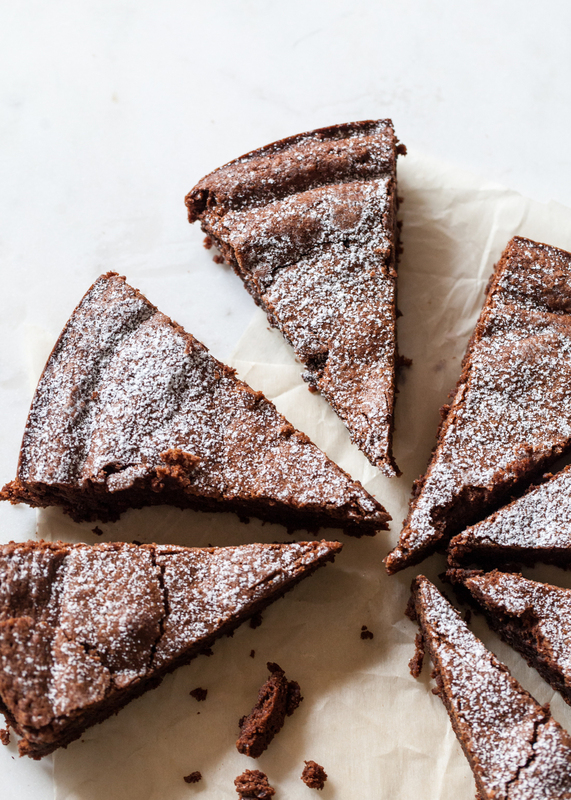 This torte just happens to be naturally gluten-free! It is the perfect dessert to serve around the holidays when large groups of people are coming together, each with their own intolerance. You could even serve it with a whipped cashew cream if you want to go the extra-mile! I know most of you probably come to this blog for the sugar-clad treats and chocolate-dripped cakes, but my hope is that you are here to try something new. Don't worry, I'm not going to re-brand the site vegan or gluten-free, but who doesn't welcome a little change every now and then? And really, this torte is made naturally without wheat flour - not that it needs any justification. Grease a 9-inch spring form pan and line the bottom with parchment paper. Set aside. Place the chocolate and butter in the top portion of a double-boiler. Stir together until almost completely melted. Remove from the heat to allow for the chocolate to continue to melt then cool. Transfer the melted chocolate mixture to a large mixing bowl. Once it has cooled slightly, stir in the hazelnut meal. In a separate bowl, whisk together the sugar and the egg yolks until thick, pale ribbons form. Fold the egg yolk mixture into the hazelnut mixture, along with the vanilla and hazelnut liqueur. In the meantime, use an electric mixer to whip the egg whites to firm peaks. Gently but deliberately fold the egg whites into the batter. Pour the mixture into the prepared pan and bake for about 35 to 40 minutes, or until the center of the torte has set. Let cool on a wire rack for about 30 minutes before removing the torte from the spring-form pan. Head on over to Domino.com for serving instructions, the hazelnut whipped topping, and more holiday ideas!